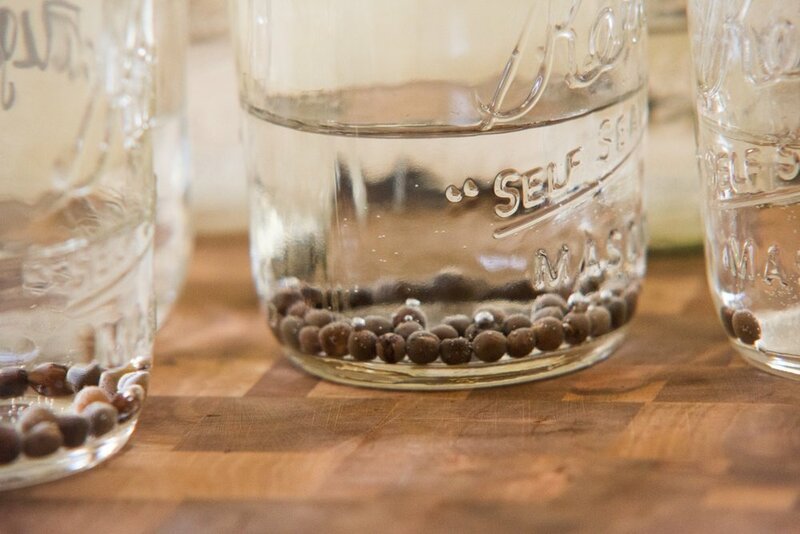 Presoaking sweet peas in room temperature water for 8-12 hours will help them to germinate faster. The idea of starting plants from seed was incredibly intimidating! Let me tell you a secret, they want to grow! You can do this! Below I'm going into growing instructions on specific varieties that you may have picked up from DST Coffee or Eddy Street Vintage Market from us. To learn more about the magic of seed starting and demystifying it all be sure to read our Nitty Gritty on Seed Starting blog post. All the flowers listed below are cut and come again, meaning- the more you cut the more they'll bloom! If you would rather not have them as cut flowers, be sure to deadhead regularly to keep them going all season long. Some of the flowers below are in our top 5! You won't regret trying your hand at growing sweet peas, their scent is delicious and they are prolific! We chose the "Spencer" variety because they play nice with the sudden change of winter to summer (that sometimes happens around here!) and can handle heat better than other sweet pea varieties. To grow: Sweet Peas can seem a little tricky to start but so worth it (and they really aren't that tricky). The key is to soak them in room temperature water for 8-12 hours (but I've gone up to 24 hours with no problem). Usually, I start soaking them before I go to bed and then pot them up in the morning while sipping on some coffee. This icy lavender is only one color in this magical mix! This mix is simply magical. With moody violets, speckled purples and some icy lavender mixed in will chase the (on and off again) winter blues away. Cornflowers (aka Bachelor Buttons) are super easy to grow, they are quick to flower and will reward you with loads of blooms! In our area of Northern Nevada, cold hardy flowers are a must. These guys thrive in cold, drought, wind- and whatever else can be thrown at them. Plus, they're edible! Their seed heads even make wonderful dried flowers. To grow: Simply direct sow into the garden. You can start them inside but they much prefer to be direct sown. These guys are tough! They can be direct sown in the fall or as soon as the soil is workable in the winter/spring. They are prolific self-sowers, be sure to plant them somewhere you don't mind them coming back year after year. Vase Life: 5-7 days. This is a different variety of calendula, Pink Surprise Calendula is a fluffy double variety that is more of an apricot than orange or pink in color. Calendula is one amazing flower, perhaps not as showy as a peony, it has tons of edible, medicinal and garden uses but I love it as a cut flower! Once again, a super cold hardy flower. After a harsh freeze last fall, all the other flowers turned a blackened death but the calendula kept on trucking. To grow: Calendula can be started 4-6 weeks before last spring frost. Calendula can also be direct sown in the fall or once the ground is workable in winter/spring. Calendula is a prolific self sower, pick a place in the garden to let them do all the dirty work for you! Vase life: about 5-7 days. To learn more about this overlooked beauty read my blog post Flower of the Month: Calendula. People either love marigolds or hate them. I'm camp love! Every year we would go to a pumpkin patch in Morgan Hill, CA and there would be a forest of these fluffy guys, they definitely command some attention. 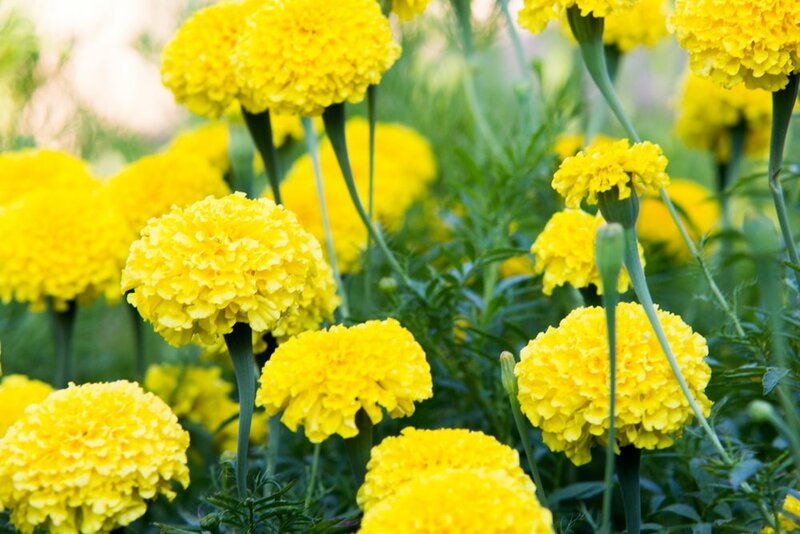 These are not as potent as french marigolds, this variety is known as African or American and are for cut flowers. Bonus, their scent isn't as pungent as the french ones! 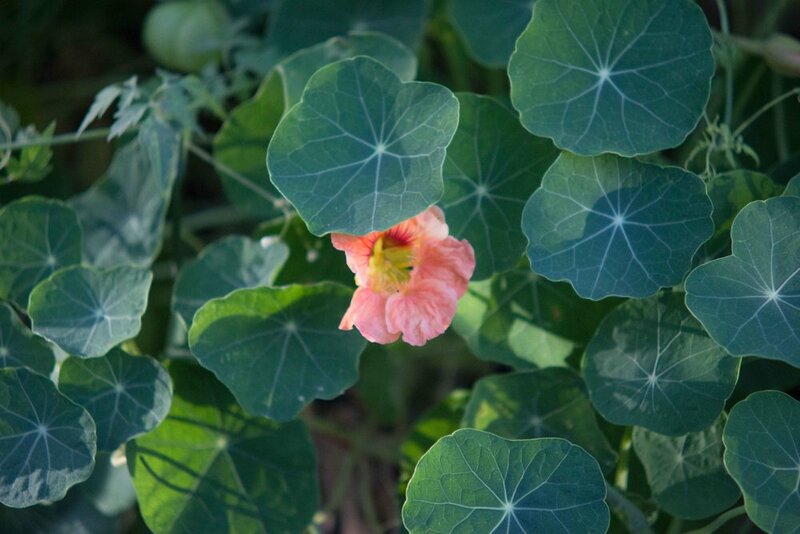 Nasturtiums are workhorses in the garden. Their vines and flowers add a whimsy to any floral design that will simply WOW! Unfortunately, I don't have a picture of the actual sunflower variety (Italian White) but starting sunflowers are all about the same! The Italian White Sunflower is a branching, pollen-less variety that is a creamy pale yellow with a dark disk that makes the creamy yellow look near white! For cut flowers, we prefer to grow sunflowers that do not have pollen. This creates less mess and a longer vase life. Don't worry! The bees still love this variety and if you're looking for pollinator friendly, they still benefit. To grow: Direct sow sunflowers up to four weeks before last frost. Sunflowers are cold sensitive when more mature but as seedlings, these guys are really tough! I've been having volunteer sunflowers come up since January. Give the sunflowers plenty of room to grow, 12-18 inches. Be aware, these guys are prolific self sowers. For optimal vase life, harvest sunflower when first couple petals are just beginning to left off the center (they will still be closed looking). Vase life expected about 7-10 days. To learn more about sunflowers be sure to read my post Flower of the Month: Sunflowers.